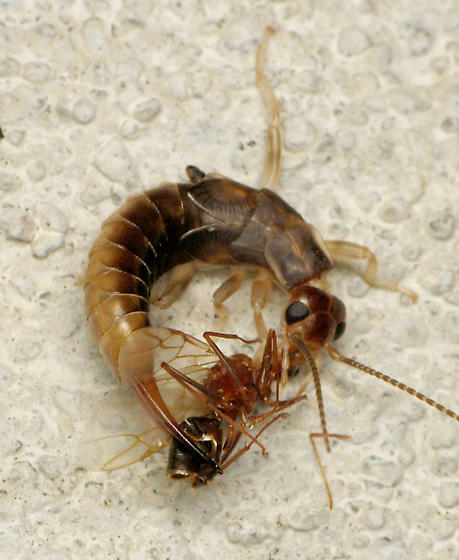 Earwigs are not as wimpy as you think! This is an immature, which complicates things. I count at least 20 segments in the antennae, which eliminates Labiidae/Spongiphoridae (adult Labidura should have 25 or more, but I believe they increase with each molt). The 2nd tarsal segment isn't dilated or extended, which eliminates Forficulidae and Chelisocidae. The tegmina meet in the middle, which eliminates Anisolabididae/Carcinophoridae. I'm not positive about Pyagropsis buscki, but what I've seen doesn't look anything like this. The wings and the coloration aren't right for an adult Labidura, but I suspect that's because this is an immature. What I can see of the forceps reminds me of Labidura. Thanks! I can try to look for more pictures of this one if that would help. Wow! I hadn't seen one catch anything before either... cool! Awesome photo - thanks for sharing!